Sweet potatoes are quite versatile and this recipe offers an alternative to traditional potato salad. The creamy buttermilk dressing offsets the sweetness of the potatoes. 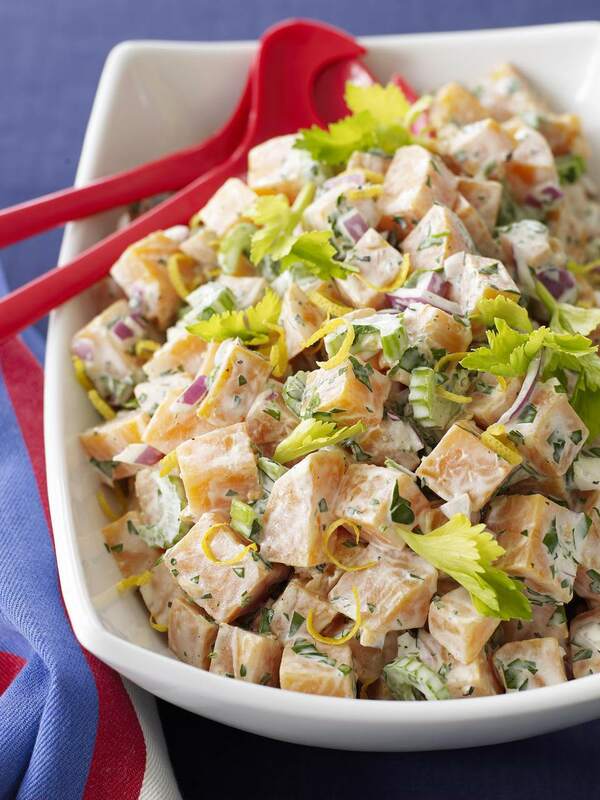 Give this fantastic recipe a try at your next cookout or game day celebration. Peel, rinse and chop sweet potatoes. Fill a large pot halfway full of water. Bring to a boil. Add salt, stir, and add sweet potato pieces to the pot. Reduce heat to medium-high, cover and let potatoes cook for 12-15 minutes. They should be fork tender but not mushy. Toward the end of cooking time, prepare an ice bath for the sweet potatoes. Fill a large bowl up with ice and water. Using a large strainer, scoop pieces out of the pot and into an ice bath. Let potatoes rest in the ice water for 10-12 minutes. Chop red onion, parsley and celery as directed above. Prepare the dressing by combining mayonnaise, buttermilk, salt, and black pepper in a large bowl. Add cooled sweet potatoes, other vegetables, and parsley to bowl, Toss well to coat. Taste and adjust for flavor. Add more mayonnaise for a creamier potato salad. Transfer to a serving bowl, cover with plastic wrap and let cool in the refrigerator for 2 hours before serving.